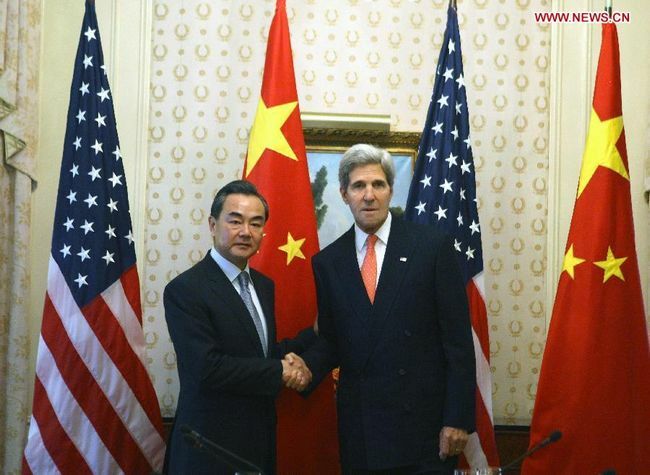 NEW YORK, Sept. 26 (Xinhua) -- Chinese Foreign Minister Wang Yi met here Thursday with U.S. Secretary of State John Kerry on the sidelines of the 68th UN General Assembly. Applauding the remarkable progress in the UN Security Council consultations over the Syria issue thanks to joint efforts from all parties, Wang said China appreciates the united and flexible manner demonstrated by all parties in the process. He also expressed hope that the process of resolving Syria's chemical weapons crisis through peaceful means rather than military action will move forward smoothly. China, Wang pledged, will continue with its constructive role to that end and join hands with other parties to push for a political solution to the Syria issue. The two foreign ministers also discussed the nuclear issue on the Korean Peninsula, Iran's nuclear program, and situations in the Asia-Pacific regions.